Highly ordered sodium silicate particles (bottom right) with a regular array of spherical pores (bottom left) form on silicon surface. The one-step synthesis is directed by the atomic ordering of the substrate, which induces the formation of a soft template for sodium silicate growth. Sodium silicate, in turn, modifies the structure of the soft template during growth, encapsulating it within its structure (top). Enlarge Image. To create more efficient catalysts, sensing and separation membrane, and energy storage devices, scientists often start with particles containing tiny pore channels. Defects between the particles can hamper performance. At Pacific Northwest National Laboratory, a team created a one-pot method that produces complex, well-structured microscopic pyramids. This approach offers control over three-dimensional material growth similar to that seen in nature, a vital benchmark for material synthesis. "It's relatively easy to grow thin layers of material," said Dr. Maria Sushko, a PNNL materials scientist who worked on the study. "Now, we can grow supported three-dimensional crystals that have a larger ordered structure on the inside as well -- a crystal within a crystal." Why It Matters: Energy storage materials that are more efficient could the way we use renewable energy. More efficient catalysts, sensors, and separators that last longer and work harder could reduce the energy demands and waste from manufacturing plants and refineries. These technologies require innovative materials, and the team's technique offers a new way to create them. Now, scientists can grow well-defined three-dimensional structures on a surface in a single step. Growing a material directly on the surface eliminates steps in testing new ideas for electrodes or catalysts. Methods: In the simplest terms, the team's approach takes advantage of a relationship among the atomic ordering of a silicon substrate, structure of organic template, and atomic structure of sodium silicate. When organic molecules and a sodium silicate precursor are combined in the right proportions and the solution is heated in the presence of the silicon surface, the silicon substrate directs the template's self-assembly along a specific crystallographic direction. 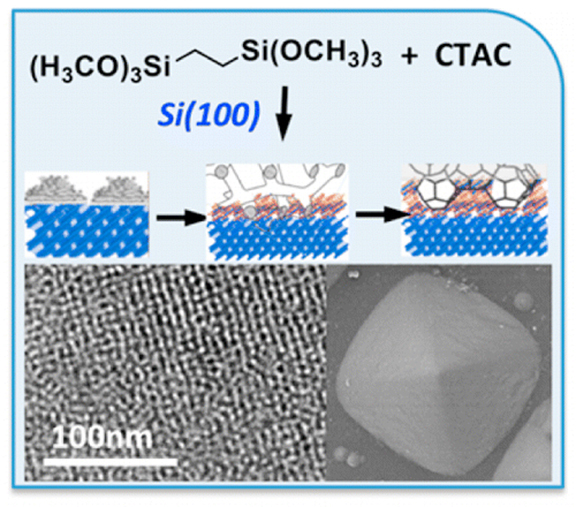 The template directs the formation of sodium silicate along the same crystallographic direction of the substrate, ensuring near-perfect lattice matching between silicon and sodium silicate. After a series of transformations, the organic template forms an array of well-defined spherical micelles several nanometers in diameter. The micelles are arranged in a cubic lattice and encapsulated into sodium silicate. The result is an array of oriented ordered porous pyramids with a well-defined cubic lattice of pores, confirmed by electron microscopes at the U.S. Department of Energy's (DOE's) EMSL, a scientific user facility. In nature, proteins direct the growth of complex structures, such as shells, bone and tooth enamel. The team's novel approach provides precise control over materials architecture similar to that seen in nature. The scientists can vary the structure and size of the particles. Their system makes different structures, with different sizes and compositions, as needed. This level of control in the laboratory is a significant benchmark for materials synthesis. What's Next? The team's technique is an important addition to the methods of synthesizing supported three-dimensional structures. The team is exploring ways to expand this technique beyond sodium silicate to other materials. 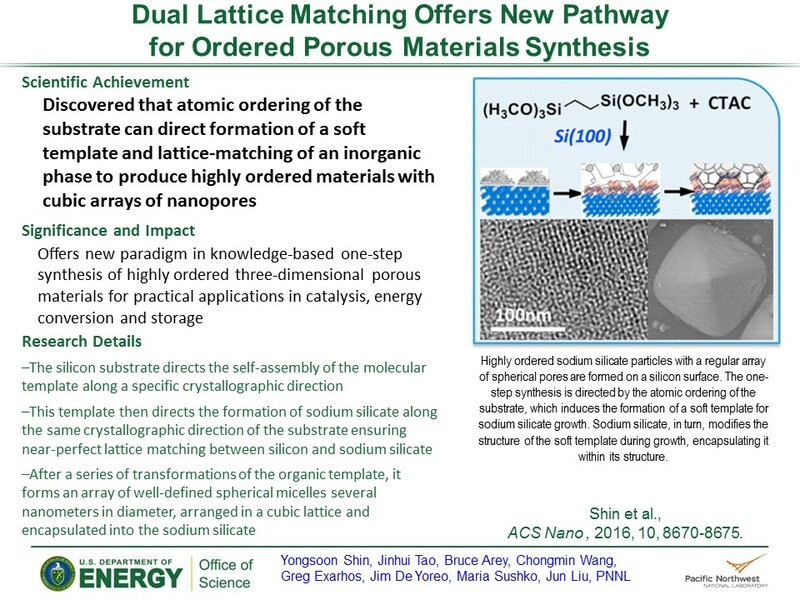 In summary: To create more efficient catalysts and separation devices, scientists would like to start with porous materials with controlled atomic-scale structures as random defects can hamper performance. At Pacific Northwest National Laboratory, a team created a one-pot method that produces complex, highly oriented three-dimensional pore structures.